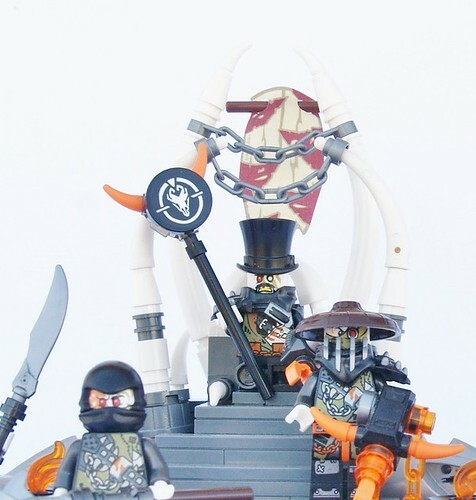 A trio of Ninjago-loving InnovaLUG builders got an opportunity to take a look at the recent dragon hunters line-up, and the steampunk style of wild survival inspired them to create a series of small vignettes featuring minifigures from #70655 Dragon Pit, #70654 Dieselnaut, #70653 Firstbourne, #70652 Stormbringer, and #70650 Destiny's Wing! So, Ninjago has always been almost my favorite theme, so I really was happy to build for it, and although this build is not as good as I wish it was I hope that soon I will provide something more worthy of the great theme and movie series! Here I built a small vignette based off the very first episode from the Hunted season. You might remember the Ninja try to contact Ninjago with a weird machine they made from scrap, and then they were caught there in their wrecked Bounty by the Dragon Hunters. Here I show the machine, as faithfully as I could, with a small portion of the wreck and with Jay playing on his wood game console. I hope you like it! Josiah added some minifigure hair from his own collection and used minifigures from #70655 Dragon Pit for his vignette! One of the craziest things that happened to the ninja in the Hunted season was being used as dragon bait! Recreating that scene was my first inspiration when I started looking at the minifigures from these sets. Kai, Zane, and Cole are all tied to one stand where their elemental powers can be tapped into in order to attract the dragons. This was a fun scene to recreate, although triangle connections are notoriously difficult in LEGO. With a little bit of bending and twisting, however, it was possible to create a tripod shaped stand for the ninja, and the end result is surprisingly sturdy, thanks to LEGO string wrapping around the logs like wire. Then it was just a matter of giving the dragon hunters a small fire to gather round, and the dragon trap was complete! This vignette features minifigures from #70653 Firstbourne and #70652 Stormbringer. Like Josiah, Geneva added hairs from her own collection. Geneva gave Daddy No Legs, one of the dragon hunters in #70652 Stormbringer a bit of an upgrade, to bring him more in line with the TV show version! The minifigures for this creation come from #70654 Dieselnaut, with one of the dragon hungers getting a spiky black hair upgrade! This last MOC spotlights three of the four ninja and a young Sensei Wu, from #70654 Dieselnaut and #70653 Firstbourne. Only Sensei Wu's hair is included in any of the sets. More Ninjago: Hunted inspired builds are coming soon, so enjoy these and stay tuned!